Sarvanivaranavishkambhin (Skt. 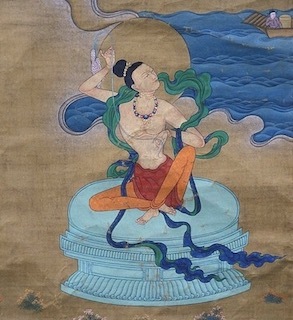 Sarvanivāraṇaviṣkambhin; Tib. སྒྲིབ་པ་རྣམ་སེལ་, Dripa Namsel, Wyl. sgrib pa rnam sel or sgrib pa thams cad rnam par sel ba) — one of the eight great bodhisattvas. He is often depicted as reddish-yellow in colour and holding a wheel of jewels. This page was last edited on 7 March 2019, at 18:33.